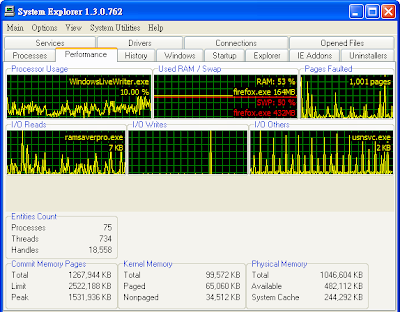 After start up the computer there will be a lot of system processes are running and these running processes can be show in the window task manager,but when you want to find out more about the content, the built-in task manager maybe cannot fullfill your requirement,you need help from system explorer. System Explorer is an enhanced Taskmanager that provides detailed information about running processes, startup programs, IE add-ons (BHOs), drivers, services network connections, system resources and more. It also keeps track of a history of processes that were started, and allows you to create file and registry snapshots that can be compared to analyze system changes in detail. System Explorer integrates online lookups into the right click menu for any process, driver or service, allowing you to retrieve additional information (and virus checking) from online sources including Google. Easy check of suspicious files via VirusTotal service. Making of System Snapshots for easy finding of system changes. System Explorer supported Window XP and Vista only. 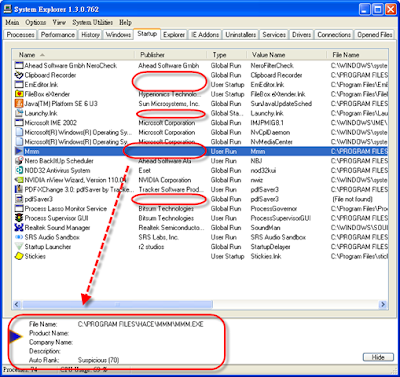 If you suspected a running processes was backdoor Trojan or malicious program and wanted to know more information about the program, it can be carried out directly through SystemExplorer.You can switch to Startup page and check for Publisher column,if there is a blank column, the more likely is a virus, then click on the item, look at the bottom of the detailed information, if Product Name,Company Name, Description is blank, it will be a relatively high level of suspicious that is a malicious program. Moreover,there is a bottom Auto Rank (automatically ranking) column, Rank higher means that the higher the security,safety programs usually Rank is 90 points (Safe level), such as the bottom of the Mmm programs, Rank is 70 points is suspicious rating, you can use this ranking to do simple judgement. If scores less than 60 points,right click on that process running and use of “File Info Search” or “File Check” to investigate it. If you felt that this software is useful,you can click ‘option’ and select ‘replace task manager’ or ‘automatically start after log in’.Then,as you press Ctrl+Alt+Del,System Explorer will appeared.